Due to a hull problem, our station boat D632 has been returned to headquarters for investigation. Relief IB1 D665 “Doris ” has replaced it. ILB launched to search for 3 year-old boy, missing for 1 hour off the Nova Centre, Prestatyn, 4 miles to the east of the station. He was last seen on his own at the water’s edge, and so the ILB was requested, and Rhyl coastguard team were also mobilised. The ILB had gone about 1 mile when Holyhead Coastguard reported the boy had been found safe and well ashore. The ILB returned to station at 1405. Our station boat D632 “Godfrey and Desmond Nall” has returned to station after refit, and D645 “Martin Jolly” has been returned to the relief fleet at Poole HQ. ILB crew paged after a man was seen attempting to cross the gutter to a sandbank on a flooding tide off the boathouse, to try to get to his dog. The man was very distressed, and was trying to get across the water which was getting deeper as the minutes passed. The ILB crew were just going out of the boathouse when it was seen that the dog was swimming ashore, and no further assistance was required, so the boat was stood down, returning at 1103.Classed as standby. ILB crew paged after a woman phoned Holyhead coastguard expressing concern for a person in a small dinghy which had disappeared from her sight. The ILB was launched, and Rhyl coastguard mobile patrol was also tasked to meet up with the lady and con the ILB on the area. On reaching the scene, the ILB crew found a single kayaker resting by holding on to the sewer buoy off Kinmel Bay, and so he appeared to be out of sight. As all was well, and the man was safely paddling to shore, the ILB returned to station by 1408. ILB crew paged for 5 people trapped on a sandbank by the incoming tide off the boathouse. As the crew were assembling, they could see all persons were off the bank and safe, and so the launch was cancelled by 1850.Classed as standby. Rhyl volunteer coastguard requested immediate launch of ILB after they had seen a woman entering the water in some distress just off the boathouse. As the crew were arriving, the woman came ashore and was escorted to the coastguard station by the coastguards. ILB was stood down. Classed as standby. The ILB crew were already on the beach with the boat, engaged in a shore exercise with Divisional Base staff, when they were informed of a woman going into the sea to fetch her dog which was stuck on a sandbank. They proceeded to the bank, and persuaded the woman not to go in, and the dog managed to swim ashore as the crew were launching the ILB to catch it. The crew then returned to their exercise at 0950 after dropping the woman and her dog back on the promenade. The mechanic and another crew member were on board the mechanic’s own boat in Rhyl harbour, when they observed a yacht “Nestor” run over a mooring and catch it’s propeller, damaging the propeller shaft, and taking water. The mechanic called Holyhead Coastguard and the ILB was launched, and other crew members went in the LandRover to the harbour with the AWB’s salvage pump. The coxswain and another crew member were ferried with the pump by the ILB crew to the yacht, and managed to stem the intake of water into the craft, so it began to float again. The ILB crew then took the yacht in tow and secured it on the yacht club slipway, where the residue of sea water was pumped out. The coxswain and crew members were picked up in the LandRover, and the ILB and other crew returned to station by 1635. ILB launched after Holyhead Coastguard received a 999 call reporting 2 inflatable dinghies with 2 adults in the water and 1 child in each inflatable, were drifting out to sea on the offshore breeze and an ebbing tide off Golden Sands camp, Towyn, 3 miles to the West of Rhyl. Rhyl coastguard team was also alerted. The ILB crew arrived on scene just as the dinghies managed to get to shore, after 2 members of the public had swum out to assist the people to shore. The coastguards and the ILB crew checked everyone was OK, and gave out some sea safety advice. The ILB then returned to station by 1635. Our ILB D632 has been returned to HQ at Poole for it’s annual refit. It has been replaced by D645 “Martin Jolly” from the relief fleet. ILB crew alerted by local people that 10 persons were cut off by the tide off Sunnyvale Camp, Kinmel Bay. ILB was launched within 3 minutes and got to scene as the people had decided to wade ashore. The crew stood by until all were safe ashore, then returned to station at 1206. ILB launched again to 12 persons cut off by the tide just off the boathouse. Assisted all ashore then returned to station at 1306. ILB brought to immediate readiness for a missing child just off the events arena at Rhyl. Child was found by the lifeguards and the ILB was stood down at 1435. ILB launched initially to an inflatable being blown offshore from Kinmel Bay. It was seen that there was no-one on board, and the ILB was diverted to 3 children in another inflatable about 1 mile out at Kinmel Bay. The ILB crew got them on board and returned them to the beach, then was again requested to investigate an object off Splash point, Rhyl, which turned out to be a large ball. The ILB returned to station at 1825. Rhyl coastguard reported an inflatable dinghy with 2 males on board, making little headway about 1/4 mile off the shore at Rhyl Sun Centre. The Beach guard boat was nearby, but stood off as the ILB approached. The crew were at the boathouse making ready for the next day’s Open day. The men were taken on board the ILB and returned to the shore. The ILB was back on station at 1506. ILB launched to assist local coastguards, ambulance and police personnel who were attending to a woman on the rocks near to the disused jetty at Llanddulas, who had tried to self harm. The ILB arrived on scene and it was decided that the only was to evacuate the woman by sea. The AWB had launched and was proceeding also. The ILB crew got the woman on board, and the paramedic also, to administer oxygen and a drip was fitted to her to counteract the effect of what she had taken. The ILB then made a slow passage to Colwyn Bay slipway, about 1.5 miles to the West, with the AWB still proceeding. The ILB landed at the slipway, and the crew with ambulance and coastguards, got the woman into an ambulance, where she was rushed to hospital. The AWB was on scene just as the ILB was starting the return journey to Rhyl, and the 2 boats returned to station at 2300. ILB put on standby to assist 18-feet dayboat “Janet” as it was approaching Rhyl harbour, having had engine failure. The AWB was escorting the boat, but due to the ebbing tide, could not get into the harbour approaches. The boat made it into the harbour, and the ILB was stood down at 1410. ILB requested to launch to assist police, local coastguards and rescue helicopter “Rescue 122” in searching for 2 young girls, who had been missing for some hours on the beach at the Nova Centre, Prestatyn. Just as the ILB was being launched, it was reported the girls had been found safe, and all units were stood down, the ILB returning to station at 1600. ILB launched after report of 4 children stuck on a sandbank at the harbour entrance. On arriving on scene, the children were observed to have got ashore safely, and the ILB returned to station at 1750. The crew were still at the station when they were tasked to investigate a large black object, just off the perch marking the entrance to the harbour. On scene, it was discovered to be a large foam ball, covered in seaweed. It was retrieved and the ILB returned to station at 1845. ILB launched to a report of a kite surfer in difficulty off Kinmel Bay. The ILB was launched, and came across an inflatable kite. The equipment was taken on board, and just as the ILB crew were commencing a search, Holyhead coastguard informed them that the surfer was safe ashore, and could see the ILB, so the crew returned to the shore, and the surfer and his kite were reunited. ILB returned to station at 1023. ILB requested to join search by Holyhead coastguard, for a missing 10 year old child, last seen playing in the water off Robin Hood camp. As the boat was launching, word came back that the child had been found by police. ILB returned to station at 1108. ILB launched to 1 adult and 1 child cut off by the tide, just off the boathouse. They were taken on board the boat and returned to the shore. The ILB was back back on station at 1155. ILB launched again, this time to 4 persons cut off by the tide to the east of the boathouse. All 4 taken on board, together with their tent, deckchairs, packed lunch, etc. ILB returned to station at 1228. The crew had just put away all the units from today’s flag day when Rhyl beach guards reported a small yacht apparently making little headway towards the River Dee, even though the boat was running with the wind. The ILB was requested by Holyhead coastguard, and launched about 4 minutes later. The yacht was reached some 12 minutes late, and the crew of the vessel stated they were OK, but were running slowly as they had to wait for the tide to get across the River Dee sandbanks to West Kirby on the Wirral. As all was well, the ILB returned to station at 1755. The mechanic was at the station when he observed a small 4m inflatable with 2 people on board, apparently having difficulty starting their engine. The pagers were activated, and the ILB was alongside some 6 minutes later. The engine was indeed not starting, and so the men were taken on board the ILB and the tender was towed back to the beach at Rhyl west end. the ILB returned to station at 2015. ILB launched to assist beach guards by recovering 8 people off a sandbank by the end perch. All were returned to beach safely. On the way back, the ILB also assisted 6 on another sandbank, then another 6 and a baby on another bank off the boathouse. Returned to station at 1508. Re-launched to 2 males over 250 metres out over 3 sandbanks off the boathouse. The beach guard had waded to chest depth to try to get them to come in a little closer, but hey refused, and so the ILB was requested. The ILB crew were also told the lads were OK, but they would get ashore themselves. So the ILB crew escorted them to shallow water and returned to station at 1530. ILB requested by crew at boathouse to go to 2 persons on an adjoining sandbank. The people were warned, but managed to get back safely, and so the crew returned to station at 1536. ILB called to assist beachguards recover 2 people on a sandbank cut off by the tide, just off the boathouse. Taken onto the ILB and returned to beach at 1324, but immediately called again. Called to another 4 on a sandbank off the end perch marking the entrance to the river Clwyd. All returned to beach, and recovered to the boathouse at 1341. Rhyl beach guard boat reported an 18-feet Shetland day boat with 2 people and 2 dogs on board, making little headway. They requested a tow into Rhyl harbour as the engine was faltering. The ILB launched and towed the boat into Rhyl harbour, then returned to station at 1517. The crew alerted Holyhead coastguard that there was an inflatable being swept out to sea off the boathouse with 1 adult and 2 children on board. The crew immediately launched and recovered the persons to the beach, returning to station at 1425. Holyhead coastguard requested launch to an inflatable off Sunnyvale camp, Kinmel bay, being swept out again. The ILB crew came alongside the inflatable, but all that was in it was a pair of child’s shoes. The ILB therefore carried out a search along the shoreline between Rhyl and Abergele to see if anyone attracted their attention. No-one came forward, and so the ILB returned to station at 1635. The ILB crew were diverted to an inflatable off Golden Sands camp, Towyn, being blown out to sea.. The crew took them into the boat, and returned them to the shore. They then returned to search the shore line for the missing girl. The crew were again re-tasked to 1 person in the water off ASDA store, Kinmel Bay. He had come out of an inflatable ring and was having difficulty swimming ashore. The ILB crew picked him up and returned him to the beach. ILB crew resumed the search for the missing girl. Nothing was found for over 1.5 hours, and due to the scant information, the search was discontinued pending further information. ILB launched after 999 call to Holyhead coastguard, reporting a young boy on an inflatable being swept out to sea off Splash Point, Rhyl. His father had swum to try to get to the inflatable jet ski, but had to return to shore. the ILB was on scene 2 minutes after launching, and brought the boy back to his family, very shaken, but otherwise OK. The ILB was back on station for 1855. Today’s tally was 6 callouts, as the coastguard classed the re-tasking at 1455 as a separate incident. ILB launched to 10 people cut off by the tide, on a sandbank at Towyn. By the time the crew arrived on scene, the people were managing to get ashore, having waded through chest-deep water to get to shore safely. The crew stood by until all were on dry land, and were recalled at 1231. The ILB was diverted to Golden Sands camp, Towyn, where 3 persons were struggling to get ashore again. They were taken on board the lifeboat, and returned to the coastguards on shore. On the way back to the station, the ILB crew came up on 3 children swimming over 100 metres out from the shore. They were given advice and returned to the beach, as the youngest girl was starting to shiver. The ILB was rehoused at 1836. ILB put on standby for 2 children on an inflatable in Rhyl harbour, again going out with the tide. They managed to get to the shore before going down the estuary, but ignored coastguard advice, and re-launched in the harbour. The tide had now ebbed sufficiently for them to wade to shore, and the ILB was stood down at 1900.Standby only. Rhyl beach guard requested ILB assistance to recover 1 adult and 4 children from a sandbank off the boathouse, as the water was over 1 metre deep in the gulley between the bank and the shore. There was already a crew at the boathouse, and so the ILB was on scene within 3 minutes. The 5 were taken on board the ILB and returned to the shore. The ILB was ready for service by 1145. The crew were at the boathouse for a normal Sunday morning, when a “Mayday” call was put out by Prestatyn Sailing club, that 2 swimmers were in difficulty off the club slipway. The wind was gusting 25 knots with a rough sea, and so the crew took the ILB by road to the sailing club. As they were turning into the club yard, it was reported the swimmers were safe ashore with minor abrasions, and needed no further assistance, first aid being given by the beach lifeguards. The ILB was returned by road by 1235. ILB crew requested to launch after Holyhead Coastguard received a report of a dinghy in trouble off ASDA store, Kinmel Bay. The ILB launched into a rough sea with the wind NW force 6, just on the limit, and went to the Kinmel Bay area. The first informant could not be contacted, and a search of the area showed only the sewer outfall buoy. As there was nothing else in the area, and due to the conditions, the crew were told to return to station. The boat was back at station at 1435. The buoy has since been reported to the coastguard, as it seems to be always lying on it’s side, and looks like an upturned dinghy. 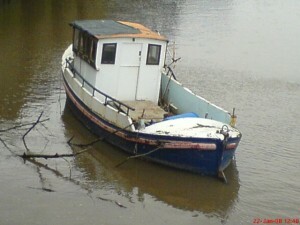 The environment agency will be requested to get this fixed as soon as possible. Both boats re-launched to assist the charity rowers getting from Prestatyn beach to Rhyl harbour in time for high water. They were towed the 3 miles back, then slipped the tow at the end perch to get into harbour under their own oar-power, attended with the ILB to help them find a mooring and get ashore. This was completed at 2205, and the ILB was ready for service at 2225. Both boats were launched after the local sport charter fishing vessel “Suveran” discovered a small kayak floating about 1/2 mile out, 1 mile west of the station. A search which also involved the local coastguards and the shore crew in the Landrover LR74, was carried out , searching up wind between Rhyl and Rhos on Sea, about 11 miles to the west. Nothing else was sighted. There were no paddles with the kayak, and no identifying marks, but it had not been in the water long. After 2 hours’ searching, with nothing found, the search was terminated. Both boats returned to station and were ready for service at 2025. Rhyl beach patrol requested local Coastguard, police, ambulance and lifeboat crew to assist in recovering a distressed female in the river Clwyd near Rhyl harbour. 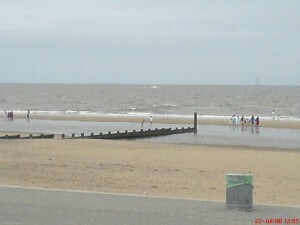 The beach guards had recovered the girl from the water ,and coastguards and police were on scene when the ILB arrived. It was agreed to transport the girl, who was very agitated and covered in thick mud, back to the boathouse, as it would be easier for ambulance personnel to look after the girl. This was done and she was given oxygen by the ILB crew, assisted by the beach guards, on the return to station. She was taken into the boathouse, and then in to the ambulance, who took her to hospital. The ILB was ready for service by 1535.Excellent co-operation between beach guards, local coastguards, police and ambulance personnel ensured the girl was given immediate assistance. ILB crew paged to launch (this was 10 minutes after the crew had left the boathouse following an Inspector’s exercise). The ILB was launched to assist local coastguards and police, together with the police helicopter NW1, for a swimmer reported over 250 metres out from the Nova Centre, Prestatyn. The helicopter located the man and directed the crew to the spot, and the ILB crew picked him up. He was hypothermic and in need of immediate care. He was rushed to the shore where the helicopter landed, and the ILB crew, ambulance and coastguards got him into the helicopter to take him to hospital. The ILB returned to station at 2240. AWB was on standby to assist should a search be necessary. All 3 launching vehicles were used to recover the beach lifeguards truck which was bogged down in the soft sand and was enveloped by the incoming tide as the lifeguards were recovering their boat. The County tractor was first on scene, and managed to tow the trunk rear-first to shallow water, where the Talus took over the tow. The County then picked up the lifeguards trailer from the coastguards, and recovered the lifeguard patrol boat. The Landrover was used to transfer additional personnel between the boathouse and the shoreline to assist in the recovery. All lifeguards units were recovered back to their station alongside the boathouse. Classed as shore-based service. Lifeboat units ready for service by 1745. ILB requested to launch to a missing swimmer. Launch cancelled before boat left boathouse. Ready for service by 1424.Classed as standby. ILB requested to launch to assist Beach Patrol boat which had suffered engine problems off Splash Point Rhyl. ILB was on scene within 5 minutes, and returned the lifeguards and the boat back to the boathouse alongside the lifeboat station. Ready for service at 1509. The LOM (Lifeboat operations Manager) received notification from Holyhead coastguard that 4 youths had tried to drive on the beach from the lifeboat slipway and had sunk the car in the soft sand. The LOM and 2nd mechanic went down to the boathouse, and told the coastguard the vehicle would prevent the ALB from launching. As the tide was about 10 metres from the car and coming in, and also it would be over 1 hour for a recovery vehicle to get to site, the RNLI operations staff at Poole HQ sanctioned the County tractor to go and try to move the vehicle. This was successfully done and the car was recovered to the promenade. The youths were suitable informed of the dangers of driving on the beach, and the reply was – ” I saw Jeremy Clarkson on Top Gear, and he was doing it”. The youths thought it was all a laugh and left immediately. The tractor was ready for service at 1123 and this is classed as a Shore-based service for the records. ILB crew paged to help coastguards search for a very intoxicated male who had told police he was going to do self-harm by going on to the beach. As it was around low water, the ILB crew searched the sandbanks far out, and the Landrover with 4 crew searched the upper beach and promenade, The Coastguards searched the promenade area and co-ordinated the teams. A male was found, but he did not match the description of the one we were searching for, so the man was handed to local police. the search continued for over 2 hours, with the whole of Rhyl beach being searched, with nothing found. The search was called off at 0130 and all units were back on station at 0145. No-one was found the next day. Classed as ILB service and also shore-based service. Holyhead Coastguard received a 999 call reporting 2 inflatables off Golden sands, Towyn, apparently in difficulty. The ILB and local coastguards were paged. The ILB proceeded to the location, and the first informant told Holyhead Coastguard of the location of the casualties, but directed the ILB to the local sewer outfall buoy. The first informant then stated the inflatables were further out, and the boathouse could see 2 small kayaks about 1.5 mils out. The ILB crew went to these kayaks and the first informant confirmed these were the 2 they had seen. The 2 men in the kayaks were OK, but returning to shore at a leisurely pace, and this was what had aroused the informant’s concerns. As all was OK, the ILB returned to station by 1458. ILB requested to launch again to 3 children in 2 inflatable dinghies reported over a mile out from Golden Sands camp, Towyn. When ILB arrived on scene the children had made it to the outer shore of the large sandbank where 72 people got stuck last week. the ILB went inside the sandbank in the gutter and supervised the children on to the shore, where Rhyl coastguard team meet them. All was well, and so the ILB returned to station at 2025. Holyhead Coastguard requested the ILB and local coastguard mobile unit to Prestatyn to investigate reports of a speedboat and 2 persons walking on the Hoyle sandbanks, about 1 mile offshore. The ILB was away within 3 minutes as the crew were already at the boathouse for the normal Sunday meeting. On arrival on scene, the boat was checked out and all was in order. The ILB was then tasked to another sandbank, but the “occupants” were found to be cormorants drying their wings. A third report sent the ILB to Talacre, to investigate a boat in the shipping channel, but they were OK too. The ILB then returned to station by 1125. Rhyl beach guard reported people stuck on the same sandbanks as yesterday. ILB launched as crew were already at boathouse and arrived on scene some 6 minutes later. In all, 11 adults and 11 children were assisted ashore. ILB returned to station at 1733. The ILB and shore crew and coastguards from Rhyl were kept busy during this afternoon due to the hot weather and an incoming tide. Changes in sandbank formations have resulted in deep gutters forming between the sandbanks, which caught many holidaymakers unaware as the tide came in behind them. Some of the gutters were over 2 metres deep. The initial call came at 3.22pm from Rhyl beach patrol lifeguards, who spotted many people cut off by the tide. They informed Holyhead coastguard, who called out the local coastguard mobile team, and the ILB crew. There were initially 40 people cut off at Golden Sands Towyn. With the teamwork of the coastguards and additional lifeboat crew on shore, together with the ILB crew, they were all safely returned to shore. At one time, the ILB had a pushchair and a family of four in it, as well as the crew! An additional 20 people were also seen cut off at Pensarn beach, and so the teams moved down the beach to assist these back to shore.2 others were assisted as the ILB was returning to Rhyl. In all, 72 people had been assisted. Some were quite oblivious to the incoming tide behind them, with a few refusing to return until they realised the water would be past their waists if they didn’t go sooner than later. Luckily there were no casualties, and the teams returned to station at 1725. Once again, the Rhyl sea rescue teams worked together to enable a successful outcome. This has been classed as 2 ILB services and 1 shore-based service with the LandRover. The Crew were at the boathouse cleaning up after the early morning AWB shout, when the coastguard requested the ILB to launch to 2 people cut off by the incoming tide off Golden sands camp, Towyn. The ILB arrived on scene just as the people were wading ashore, and as all was well, returned to station by 1555. ILB requested to people cut off by the tide off Golden Sands camp, Towyn. It was reported all were safe before crew arrived, so launch cancelled. Classed as standby. The crew were already at the boathouse for the 999 emergency services day when some of them spotted 4 people cut off by the incoming tide, on a sandbank just off the boathouse. Rhyl Beach Patrol were already going to scene on a quad bike, and the ILB soon followed, no pagers required. The ILB launched in the shallow gutter to the sandbank, which was nearly covered by the tide, and all 4 were taken on to the ILB and returned to shore to the beach patrol for a bit of sea safety advice. the ILB then re-launched on exercise at 1152. ILB was requested by Holyhead Coastguard to launch to 2 children stuck on an inflatable dinghy on a sandbank in the middle of the river Clwyd at Rhuddlan, 2 miles upstream from the harbour at Rhyl. The ILB, towed by the LandRover, together with the local coastguard mobile, proceeded by road to Rhuddlan, to find that the incoming tide had floated the dinghy, and the children had managed to scramble ashore, and all was well. The units returned to station by 1600. One of the probationary crew was looking out of the crew room window and noticed a woman lying face down in one of the shallow gutters between the sand banks, with the tide starting to come in. The mechanic notified Holyhead coastguard and the 2 crew went out to the woman in the station LandRover. On scene, it proved very difficult to rouse the woman, who was obviously intoxicated. She could not get up unaided, and so the crew picked her up and put her in the LandRover, calling for an ambulance via the coastguard. The ambulance met the crew at the boathouse, and the woman was tended to in the ambulance, and then taken to hospital. The Landrover required cleaning after the woman, and the vehicle was again ready for service at 1405. Rhyl volunteer coastguard station officer was at the coastguard station alongside the boathouse, when he saw 2 adults and 3 children cut off by the incoming tide on a sandbank. The ILB crew were paged, and assembled, but by then, the 5 had managed to wade waist-deep through the gutter. The ILB was stood down at 1645.The coastguard interviewed the party when they were safely on the promenade, and the male adult stated he was very happy that there were people watching the beach and prepared to come to their help. A member of the public reported they could see an orange object in the water about 1.5 miles off Rhyl harbour, to the local volunteer coastguards on mobile patrol. They reported to Holyhead coastguard, and the ILB was requested, launching some 8 minutes later. The local survey vessel “Offshore Provider”, helmed by emergency Coxswain Paul Archer-Jones, also proceeded to the area, and a search was carried out in the vicinity of the heavy lifting vessel “Svanen” which was erecting the monopiles for the New Rhyl Flats windfarm. After searching for about 1 hour, nothing had been seen, but the boats suggested what the person had seen, was the pick-up buoys for the 8 anchor lines holding the HLV in position. As the ILB was returning, a fault developed on the engine, and the ILB was towed back to shore by “Offshore Provider” and recovered at Rhyl. A new engine was brought from divisional base in St.Asaph and the ILB was ready for service by 16.30 after a short sea trial. A sheared bolt on the engine mounting bracket was found to be the fault on the old engine. ILB was launched to reports from the police of a missing vulnerable youth between Rhyl and Talacre . Local coastguards were also alerted. After searching the shoreline for about 30 minutes, the youth turned up at Presthaven sands holiday camp, just off the beach, so all units were stood down. Due to the choppy conditions, the ILB was recovered at Prestatyn and returned to station by road at 1802. Rhyl Coastguard team were alerted via Holyhead Coastguard after a 999 call from a member of the public who said they could see what looked like a body in the water off the Nova centre, Prestatyn. The ILB crew were also paged and launched within 5 minutes. They were directed to the object by the local coastguards and reported it was a large log about 4 metres long, half submerged. Nothing further was found in the area, and the ILB returned to station by 1502. The mechanic and some of the crew were polishing the AWB hull after Sunday’s exercise when they spotted 3 people trapped by the tide. 2 were wading ashore up to their waists, but the third refused to move, and started waving frantically. The others then returned to the sandbank. The ILB crew were on scene in 3 minutes, and the 3 people were picked up in the ILB and returned to the boathouse, wet and shivering. After a check up by ambulance personnel, they were found to be cold but OK, and they carried on with their day out at Rhyl. The ILB was ready for service at 1216. Holyhead Coastguard had received some reports that the ex-RNLI Liverpool class lifeboat “Silent Waters” had broken it’s mooring in Rhyl harbour, and could become a hazard to boats in the harbour. The ILB crew launched and got a new line round the mooring bollards of the boat, and managed to get the boat on to a safe mooring in the centre of the harbour. this was a difficult operation as the boat weighed about 5 tonnes, but was also weighted down with water and mud from the harbour. The ILB returned to station at 1220. A hoax caller who sparked a £45,000 air and sea search for a “missing” swimmer has been jailed for 15 months. Patrick Lane, 35, from Bylchau, Denbighshire, pleaded guilty at Caernarfon Crown Court to causing a public nuisance. An RAF helicopter, two lifeboats, police and coastguards joined a search after Lane dialled 999 and reported a friend missing off the Rhyl coast. Judge Merfyn Hughes QC said Lane had a “complete disregard” for public safety. The court heard Lane gave four different accounts of what happened when he contacted the emergency services on 1 August 2007. ILB crew paged after reports of a woman and 2 children seen thrashing in the water off the Sky tower at Rhyl. Last reports were the children had come out of the water, but the woman was still in. The ILB crew were just launching when the police reported they had found the woman, dripping wet, on one of the roads leading away from the promenade. ILB returned to station at 1528.Classed as standby.